Muse with Violin Screen (detail), 1930. Paul Fehér (Hungarian, 1898–1990), designer. in art and design during the 1920s and early 1930s. 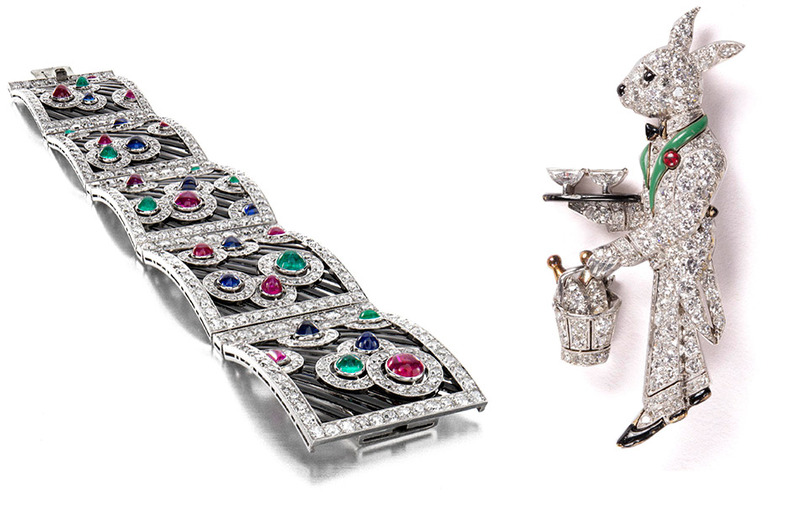 exuberant selection of jewelry, fashion, paintings, decorative arts and motorcars. After the First World War, with the postwar map of Europe redrawn and social mores redefined, design influences merged—especially in Paris, Vienna and across the United States. New fortunes, primarily American, fueled self-indulgence and consumption, prompting design featuring vibrant colors, sumptuous materials and a unique sense of freedom. pendant: 9.5 x 1.1 x 0.6 cm. Craftsmanship and experimentation flowed back and forth across the Atlantic, with an influx of European émigré designers coming to America and American creative talent traveling and studying abroad. 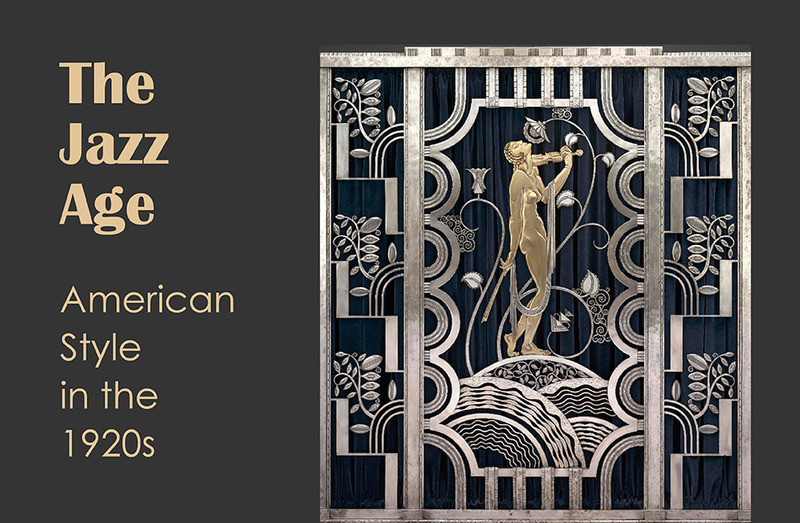 Organized in six sections, The Jazz Age: American Style in the 1920s explores objects affected by the purchasing power of new fortunes and new tastes, and reveals a decade marked by sharp contrasts as new ideas began to challenge traditional revival styles. 7.2 x 4.5 x 0.9 cm. Orchestra Bracelet, c. 1930s. Unknown. Diamonds, platinum, cabochon sapphires, carved onyx; 18 x 2 x 0.5 cm. Neil Lane Collection. Photo: Gary Kirchenbauer. 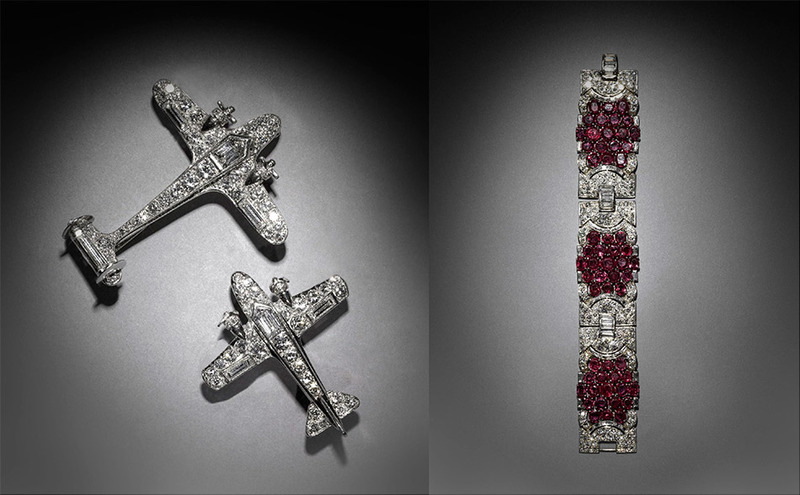 LEFT: Pair of Airplane Brooches, 1930s. Cartier (French, Paris, est. 1847). Diamonds, platinum; l. 3.3–4 cm. Neil Lane Collection. Photo: Gary Kirchenbauer.RIGHT: Bracelet, c. 1920s. Attributed to Mauboussin (French, Paris, est. 1827). Diamonds, platinum, rubies; 17.8 x 2.5 x 0.4 cm. Neil Lane Collection. Photo: Gary Kirchenbauer. LEFT: Bracelet, 1925. Boucheron (French, Paris, est. 1858). Platinum, gold, osmium, diamonds, rubies, sapphires, emeralds, enamel; 20 x 3.2 cm. Siegelson, New York. Photo: Siegelson, New York. 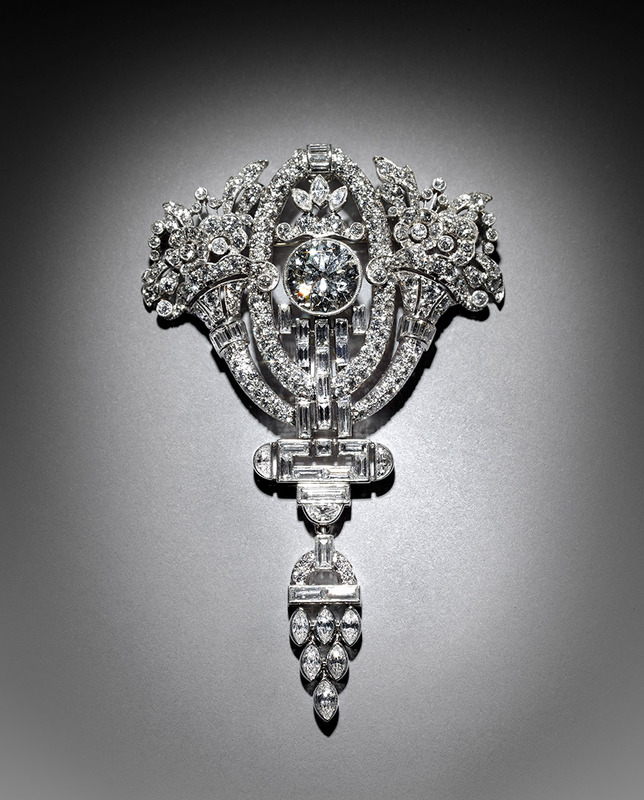 RIGHT: Brooch, 1929. Raymond C. Yard (American, New York, est. 1922). Diamonds, emeralds, ruby, platinum, onyx; 4.5 x 1.9 x 0.6 cm. Vartanian & Sons. Photo: Matt Flynn. A New Look for Familiar Forms. Often invoking earlier French styles but with pared-down form. 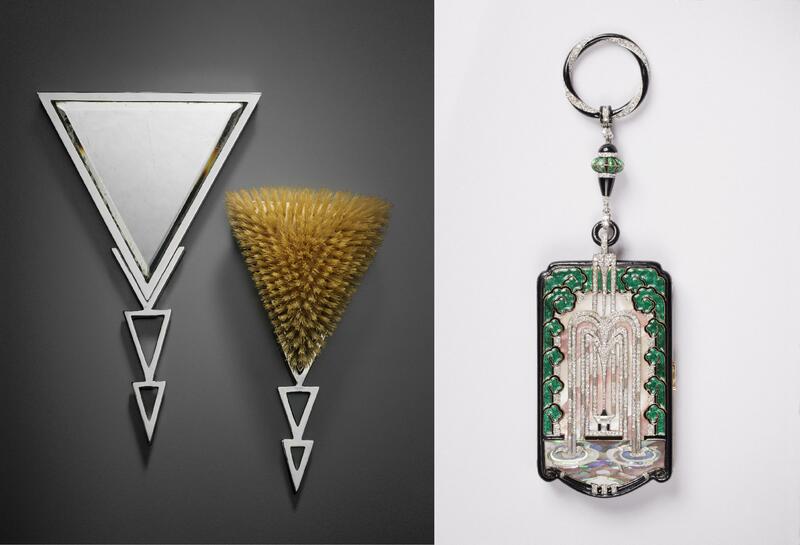 This trend influenced American manufacturers, while silver and jewelry design forged an important connection between traditional techniques and new influences. 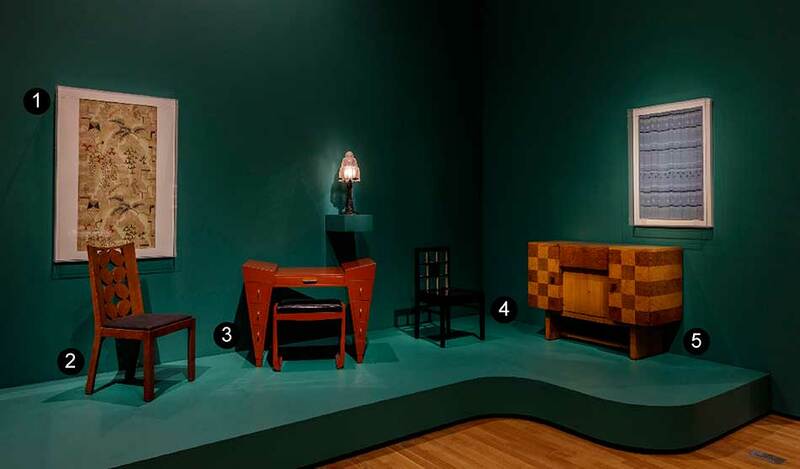 Simple shapes and minimalistic decoration defined modernism in the first half of the 1920s, as well as the use of bold geometric shapes that took hold in the latter half of the decade. 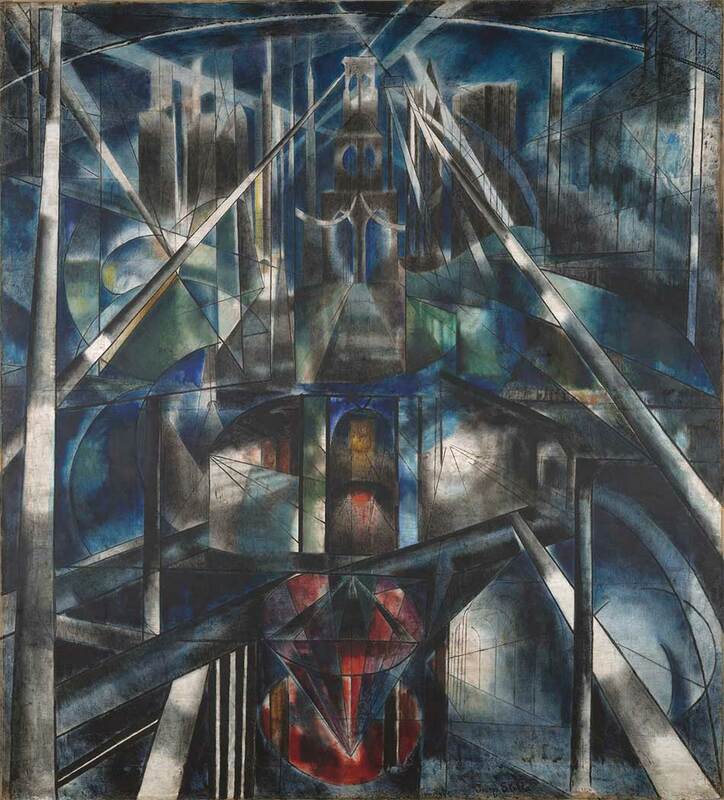 These abstracted and often fragmented shapes were influenced by fine art movements such as Cubism, but they also emanated from architectural sources as diverse as the stepped shapes of ancient Mayan temples, the setback profiles of skyscrapers and the open-plan arrangements of interior spaces, especially those of Frank Lloyd Wright. Four-Piece Tea Service, 1934. Paul A. Lobel (American, b. Romania, 1899–1983), designer. International Silver Company, Wilcox Silver Plate Company Division (American, Meriden, CT, 1898–c. 1960), maker. Electroplated nickel silver, wood; tray: 2.5 x 45.8 x 20.6 cm; sugar bowl: 10.2 x 10.2 x 14 cm; teapot: 15.2 x 15.2 x 21 cm; creamer: 10.2 x 10.2 x 14 cm. The Metropolitan Museum of Art, Gift of M. H. Lobel and C. H. Lobel, 1983, 1983.493.1–4. Image: © The Metropolitan Museum of Art. Image source: Art Resource, NY. Cubic Coffee Service, 1927. 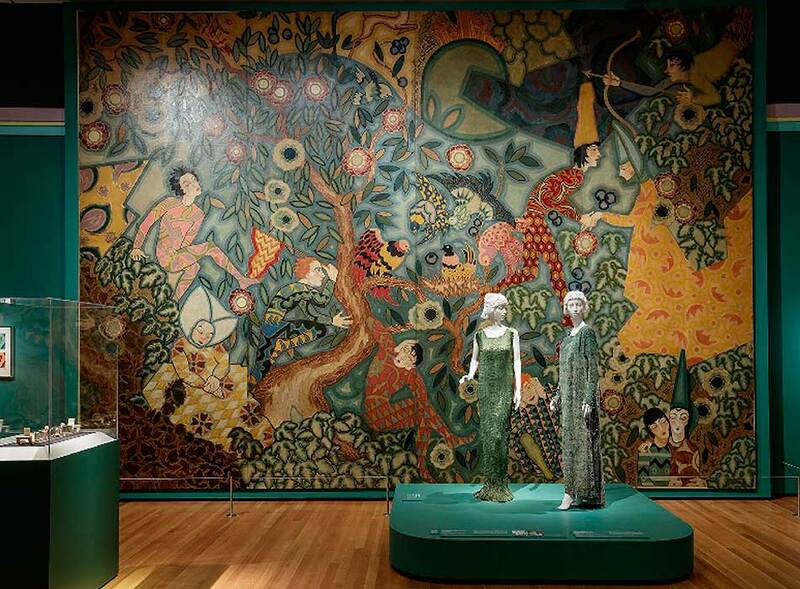 Erik Magnussen (Danish, 1884–1961), designer. Gorham Manufacturing Company (American, Providence, RI, 1865–1967), maker. 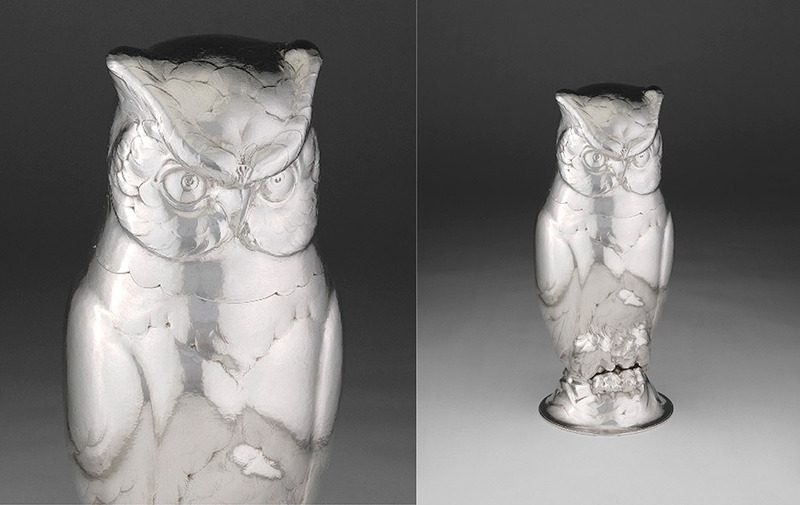 Silver with gilding, ivory; 24.1 x 54.6 x 34 cm. Museum of Art, Rhode Island School of Design, The Gorham Collection, Gift of Textron Inc., 1991.126.488. 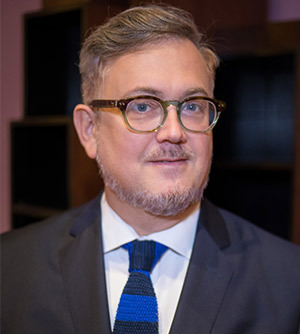 Photo: Erik Gould, Courtesy of the Museum of Art, Rhode Island School of Design, Providence. Five-Piece Coffee and Tea Service, 1929. George Christian Gebelein (American, b. Germany, 1878–1945), designer. 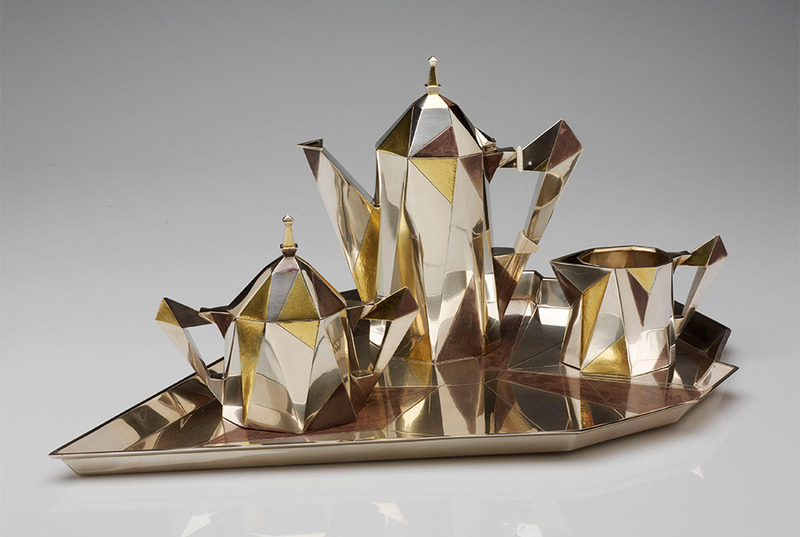 Gebelein Silversmiths (American, Boston, 1908–c. 1960), maker. 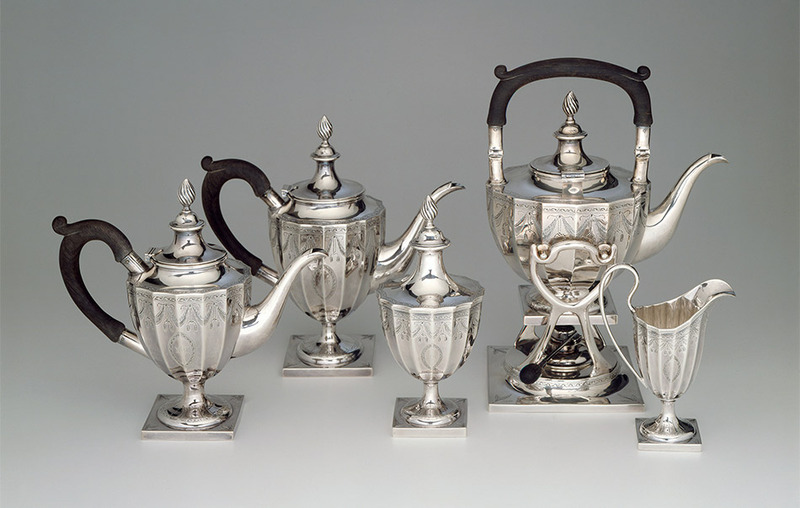 Silver, ebonized wood; tea kettle on stand: 14.5 x 24.5 x 15.6 cm; coffee pot: 25.2 x 25.2 cm; covered sugar bowl: h. 21 cm; creamer: 16 x 6.3 x 11.5 cm; teapot: 22.3 x 11.2 x 24 cm. Museum of Fine Arts, Boston, Anonymous Gift, 1986.778–782. Photo: © 2017 Museum of Fine Arts Boston. Cocktail Shaker, 1931. Peer Smed (American, 1878–1943). Silver; h. 39.3 cm. The Art Institute of Chicago, Restricted gift of Quinn E. Delaney; Wesley M. Dixon Jr. Fund, 1990.179. 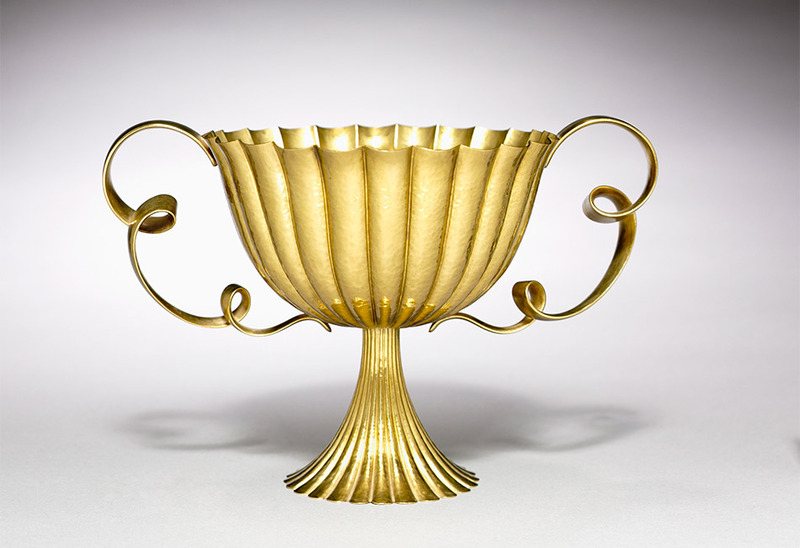 Two-Handled Cup, c. 1922. 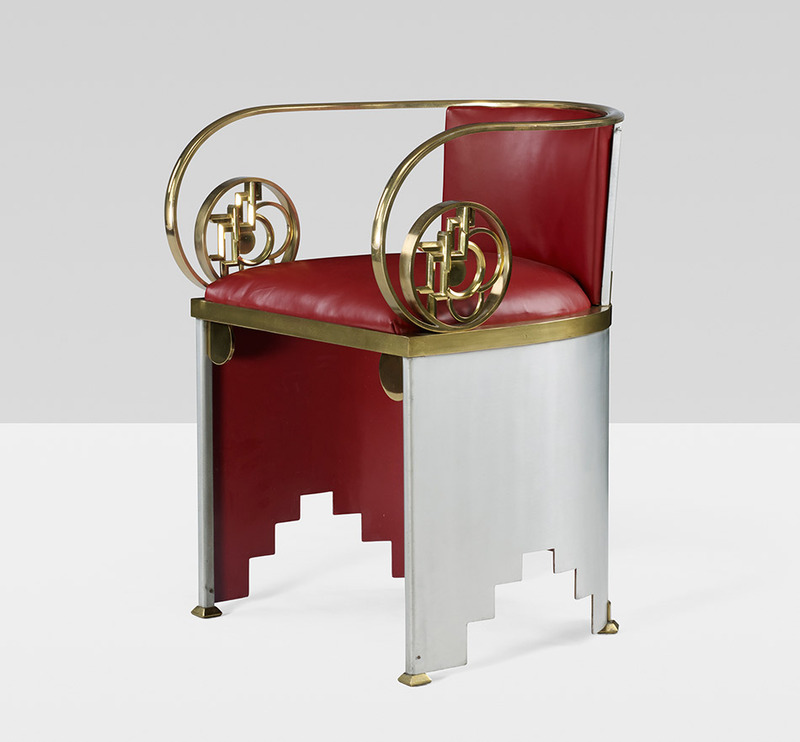 Josef Hoffmann (Austrian, 1870–1956), designer. Wiener Werkstatte (Austrian, Vienna, 1903–32). Brass; 18.8 x 27.9 x 18.3 cm. The Cleveland Museum of Art, Andrew R. and Martha Holden Jennings Fund, 1983.71. Actaeon, 1925. 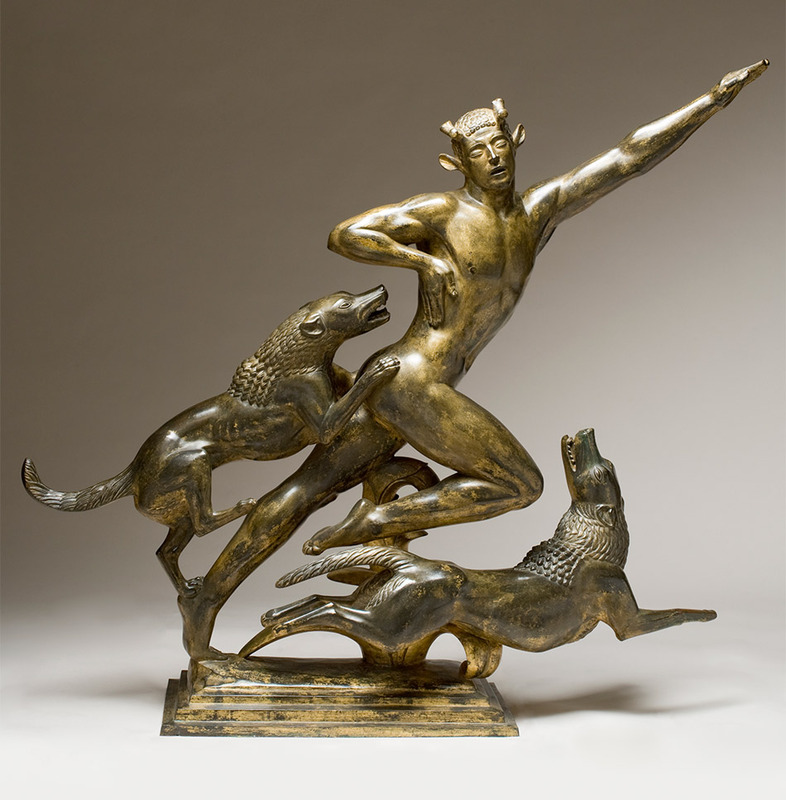 Paul Manship (American, 1885–1966). Gilt bronze; 120.7 x 130.8 x 33.7 cm. David Owsley Museum of Art, Frank C. Ball Collection, Gift of the Ball Brothers Foundation, 1995.035.164. 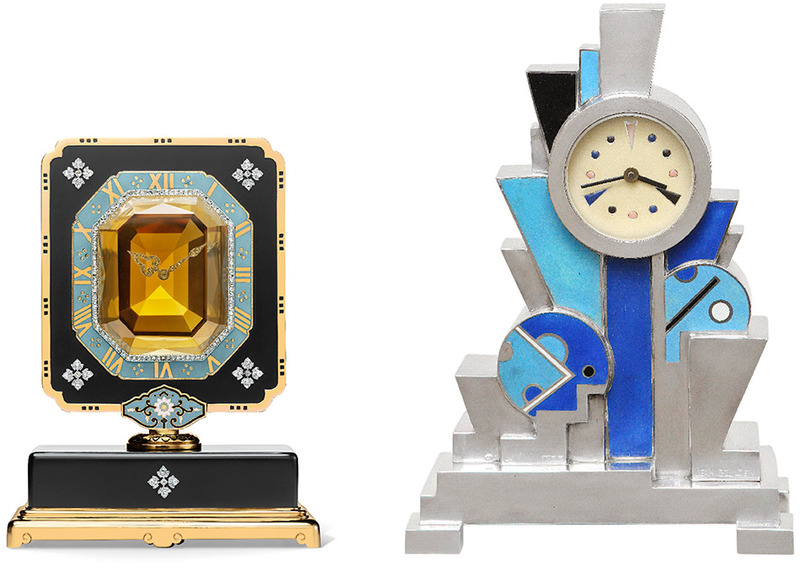 LEFT: “Mystery” Clock with Single Axle, c. 1921. Cartier (French, Paris, est. 1847). Owned by Anna Thomson Dodge. Gold, platinum, ebonite, citrine, diamonds, enamel; 12.9 x 9.7 x 4.8 cm. Cartier Collection, Inv. CM 29 C21. 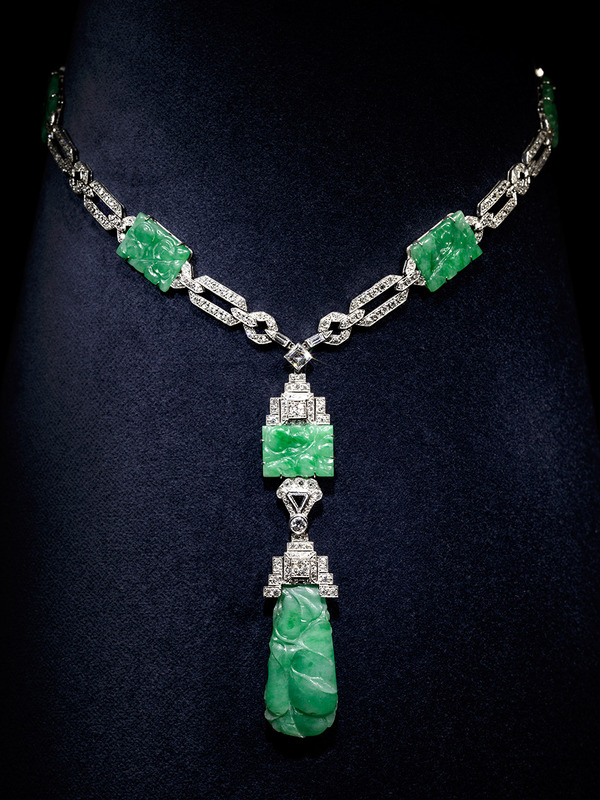 Photo: Marian Gerard, Cartier Collection © Cartier. RIGHT: Clock, 1928. Jean Goulden (French, 1878–1946). Silvered bronze, colored champlevé enamel; 36.2 x 25.4 x 12.7 cm. Stephen E. Kelly / Kelly Gallery, New York. Photo: Josh Gaddy. © 2016 Artists Rights Society (ARS), New York / ADAGP, Paris. LEFT: “Cocktails and Cigarettes” Punch Bowl, 1931. 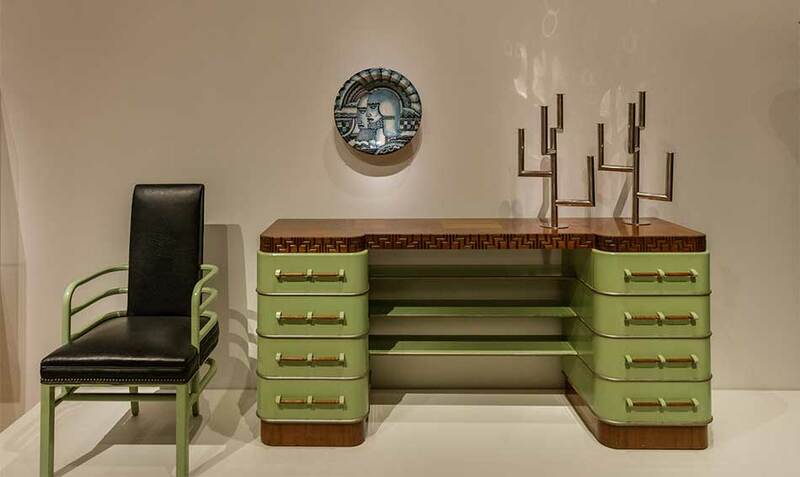 Viktor Schreckengost (American, 1906–2008), designer. Cowan Pottery Studio (American, Rocky River, OH, 1912–31). 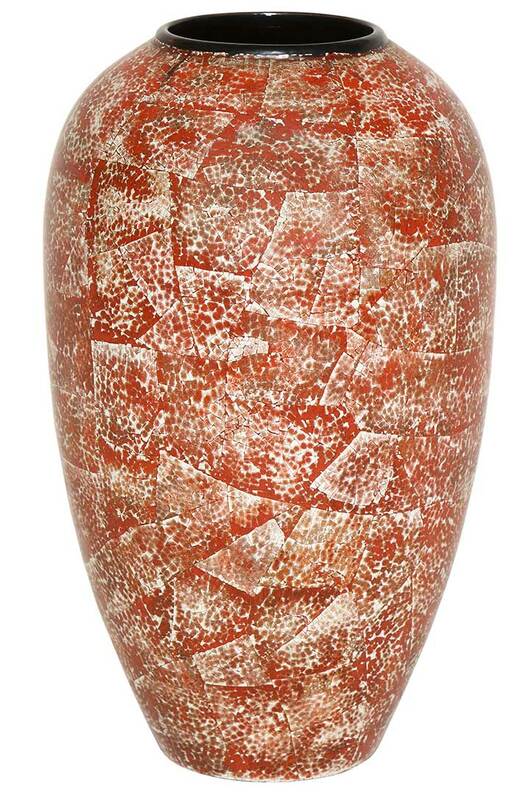 Glazed earthenware with engobe, sgraffito; h. 23.5 cm, diam. 42.8 cm. The Cleveland Museum of Art, Gift of Elizabeth Mather McMillan, 2000.128. 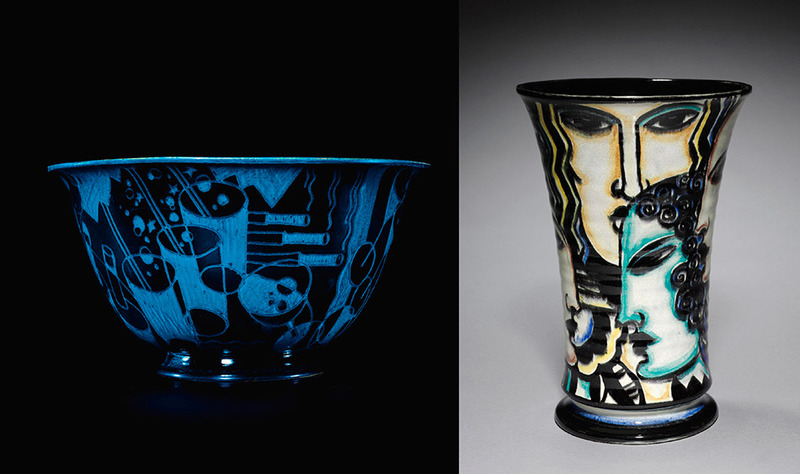 Viktor Schreckengost™ with permission from American da Vinci, LLC.RIGHT: Four Seasons Vase, 1931–32. Viktor Schreckengost (American, 1906–2008), designer. Cowan Pottery Studio (American, Rocky River, OH, 1912–31), maker. Earthenware; h. 29.6 cm. The Cleveland Museum of Art, Hinman B. Hurlbut Collection, 964.1932. Viktor Schreckengost™ with permission from American da Vinci, LLC. A new ideal for the young modern woman, dictating more revealing fashions and calling for colorful jewelry in exotic forms as well as accessories for cosmetics and cigarette smoking that lent additional glamour and adventure to liberated lifestyles. 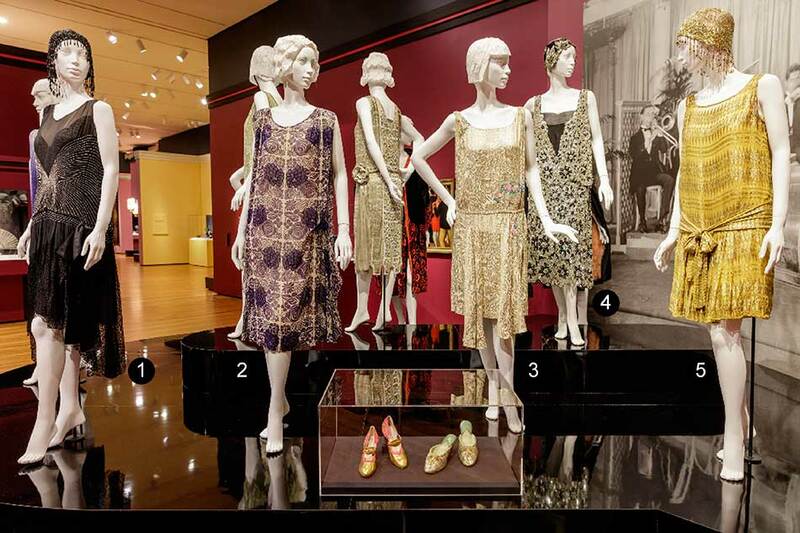 Fashionable people “stepped out” to nightclubs on both sides of the Atlantic to hear jazz music, which transformed traditional concert venues into dance halls and gave the era a new pulse. 1: Kate Belinson Inc. (American, Brooklyn, NY, active 1920s) Evening Dress with Starburst and Underslip, 1927-29. Black chiffon, silver beads, lace , trim. Kent State University Museum, Silverman/Rodgers Collection, KSUM 1983.1.361. 2. Unknown Designer/Manufacturer. Evening Dress and Underslip, c. 1925. Green silk chiffon; silver, gold, and clear beads. Kent State University Museum, Gift of the Martha McCaskey Selhorst Collection, KSUM 1996.58.346a–b. 3. Unknown Designer/Manufacturer Probably American. Silk, woven gold pattern, silk floss embroidery, gold and silver beads. Metallic Evening Dress, c. 1925. Kent State University Museum, Gift of Mr. & Mrs. Albert A. Augustus, KSUM 2004.28.11. Photo: Sara Hume, Courtesy of the Kent State University Museum. 5. Unknown Designer/Manufacturer French. Evening Dress, c. 1925. Yellow silk chiffon with gilt thread. Kent State University Museum, Gift of Mr. and Mrs. Richard Fetzer, KSUM 1986.102.1. 6. Unknown Designer/Manufacturer European, Cape, c. 1920. Silk, embroidery, marabou feathers. Western Reserve Historical Society, Cleveland, Ohio, Gift of Mrs. Burton Nobil, 69.8.1. 7. 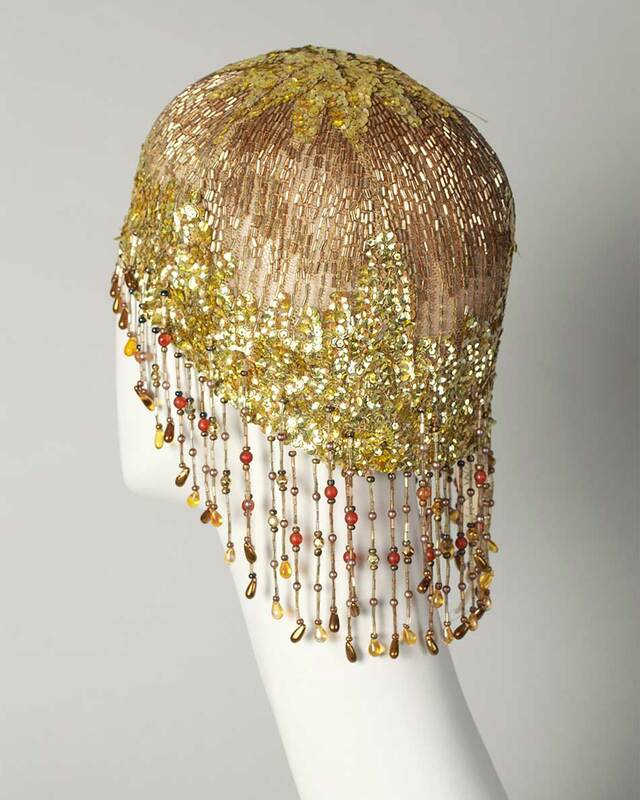 Attributed to House of Worth (French, Paris, 1858–1956) Dress, 1926 Silk, glass beads. Western Reserve Historical Society, Cleveland, Ohio, Gift of Mr. Frederick C. Chandler and Mrs. Montgomery Frazier, 91.22.7. 8. Unknown Designer/Manufacturer American. Worn by Miss Ruth L. Schneider, Buffalo, NY. Wedding Dress, c. 1924. White silk with applied sequined decoration. Western Reserve Historical Society, Cleveland, Ohio, Gift of Mr. and Mrs. Walter Oswald, 69.88.1. 9. Attributed to Paul Poiret (French, 1879–1944) Evening Dress and Underslip, c. 1925. Green silk chiffon; silver, gold, and clear beads. Kent State University Museum, Gift of the Martha McCaskey Selhorst Collection, KSUM 1996.58.346a–b. Unknown Designer/Manufacturer American. Hat (Cloche), c. 1920s. Net ground, gold beads, iridescent sequins Kent State University Museum, Silverman/Rodgers Collection, KSUM 1983.1.1658. Photo: Sara Hume, Courtesy of the Kent State University Museum. LEFT: Elsa Tennhardt (American, b. Germany, 1889–1980) E. & J. Bass Company (American, New York, c.1890–1930), maker. Vanity Mirror and Hair Brush Set, designed 1928, made c. 1928–30. Mirror: silver plate, mirror glass. Brush: silver plate, boar bristles Mirror: l. 27.5 cm. Brush: l. 24 cm. Museum of Fine Arts, Boston, The John Axelrod Collection, 2014.1290.1–2 Photo: © 2017 Museum of Fine Arts, Boston. RIGHT: Mauboussin (French, Paris, est. 1827) Owned by Yvonne Printemps. Compact, 1925. Enamel, mother-of-pearl, diamonds, onyx, gold, platinum 17.8 x 5.1 x 1.3 cm Vartanian & Sons Photo: Matt Flynn. Blues, 1929. Archibald J. Motley Jr. (American, 1891–1981). Oil on canvas; 91.4 x 106.7 cm. Collection of Mara Motley, MD, and Valerie Gerrard Browne. © Valerie Gerrard Browne / Chicago History Museum / Bridgeman Images. 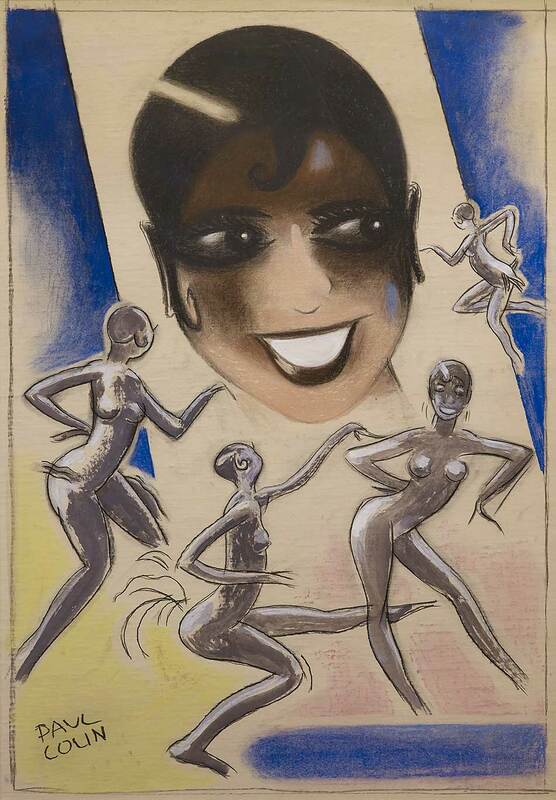 Josephine Baker / Columbia, 1930. Paul Colin (French, 1892–1985). Crayon and gouache on paper; 111.8 x 82.6 x 3.8 cm. 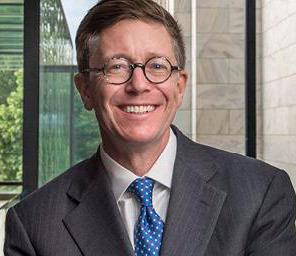 The Collection of Richard H. Driehaus, Chicago. Photo: John Faier. © 2017 Artists Rights Society (ARS), New York / ADAGP, Paris. 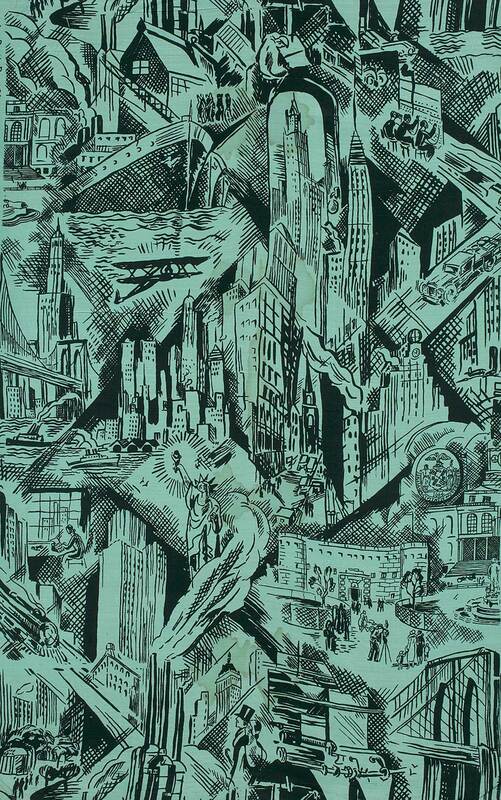 “Manhattan” Textile, 1930. Ruth Reeves (American, 1892–1966), designer. W. & J. Sloane (American, New York, 1843–1985), retailer. Silk shantung; 137.2 x 89.5 cm. Collection of the New-York Historical Society, Gift of Mrs. Bella C. Landauer, 1945.82. Photo: © New-York Historical Society. Eiffel Tower, 1924. 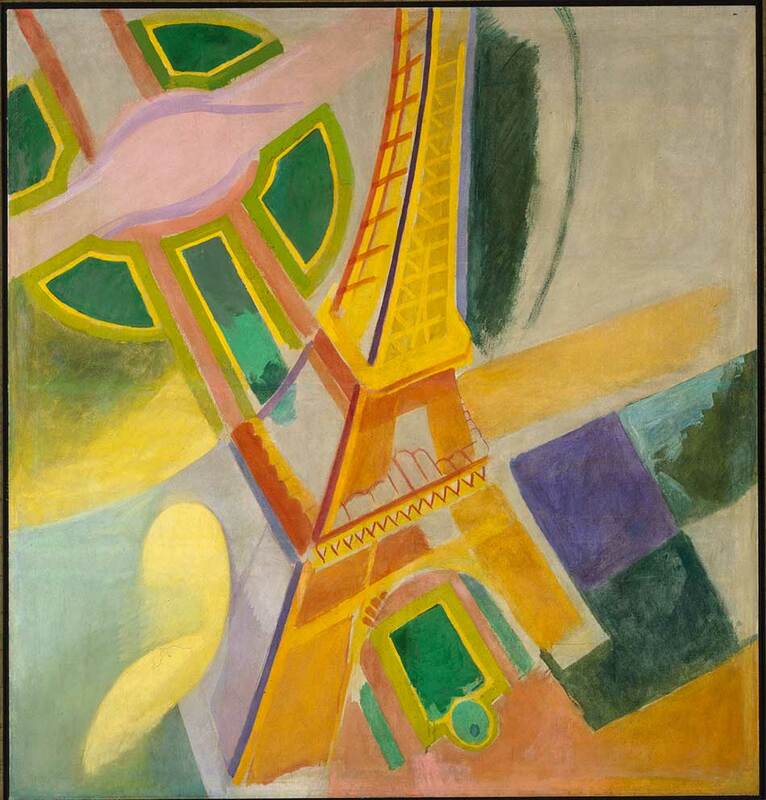 Robert Delaunay (French, 1885–1941). Oil on canvas; 184.2 x 174.3 x 3.8 cm. Dallas Museum of Art, Gift of the Meadows Foundation, Incorporated, 1981.105. Brooklyn Bridge, 1919–20. Joseph Stella (American, b. Italy, 1877–1946). Oil on canvas; 215.3 x 194.6 cm. Yale University Art Gallery, Gift of Collection Société Anonyme, 1941.690. Photo: Yale University Art Gallery. Composition with Red, Yellow, and Blue, 1927. 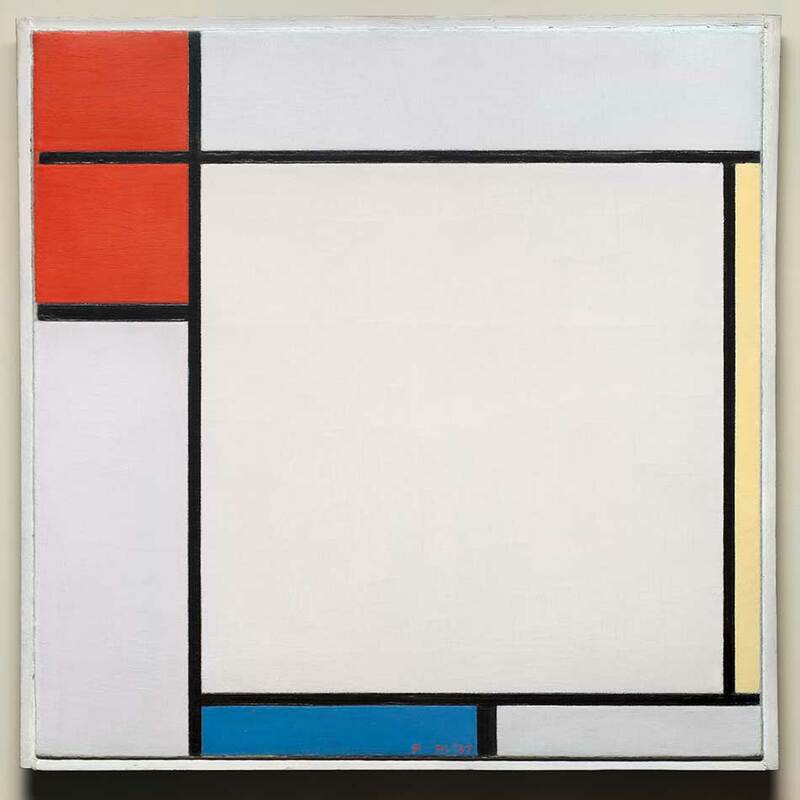 Piet Mondrian (Dutch, 1872–1944). Oil on canvas; 62.2 x 62.6 x 10.8 cm. The Cleveland Museum of Art, Contemporary Collection of the Cleveland Museum of Art, 1967.215. © 2017 Mondrian/Holtzman Trust. 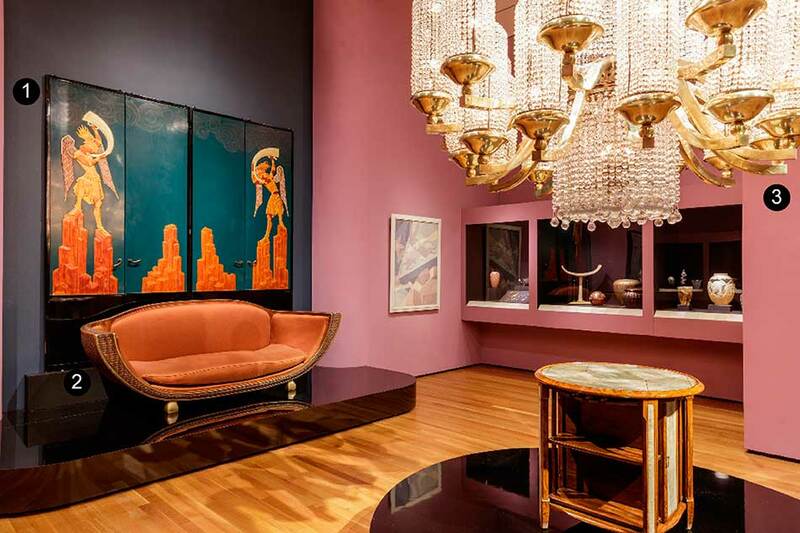 The United States became the leading marketplace for innovative architecture, interior design, decorative art, with industrial design moving into the domestic sphere. 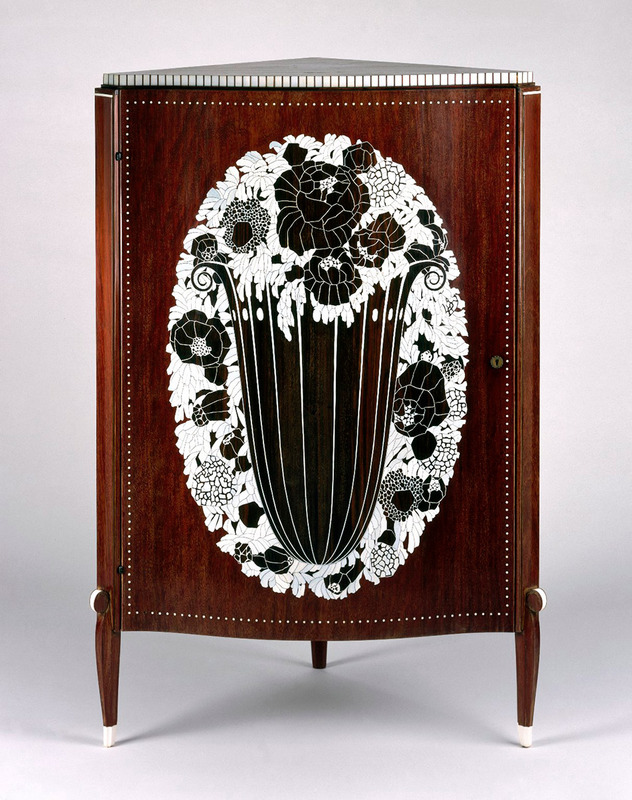 Corner Cabinet, c. 1923. Émile-Jacques Ruhlmann (French, 1879–1933). Kingwood (amaranth) veneer on mahogany, ivory inlay; 126.7 x 80.6 x 59.7 cm. Brooklyn Museum, Purchased with funds given by Joseph F. McCrindle, Mrs. Richard M. Palmer, Charles C. Paterson, Raymond Worgelt, and an anonymous donor, 71.150.1. Photo: Brooklyn Museum. Armchair from the International Exposition of Art and Industry, 1928. Walter von Nessen (American, b. Germany, 1889–1943). Aluminum, brass, leather; 68.6 x 50.8 x 50.8 cm. Private collection. Photo: courtesy of Wright. Dressing Table and Bench, c. 1929. After Léon Jallot (French, 1874–1967). Lord & Taylor (American, New York, est. 1826), retailer. Lacquered joined wood, mirror glass, metal; table: 79.3 x 105.4 x 60.3 cm; bench: 49.5 x 54.8 x 31.5 cm. Cooper Hewitt, Smithsonian Design Museum, Gift of James M. Osborn, 1969-97-7a/i. 1. Séraphin Soudbinine (French, b. Russia, 1870–1944) Jean Dunand (French, b. Switzerland, 1877–1942), maker. 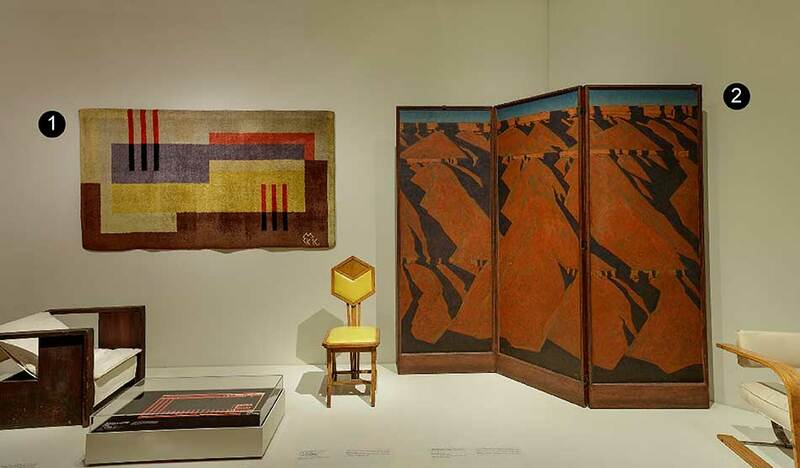 Pair of Doors for the Music Room of Mr. and Mrs. Solomon Guggenheim, 1925–26. 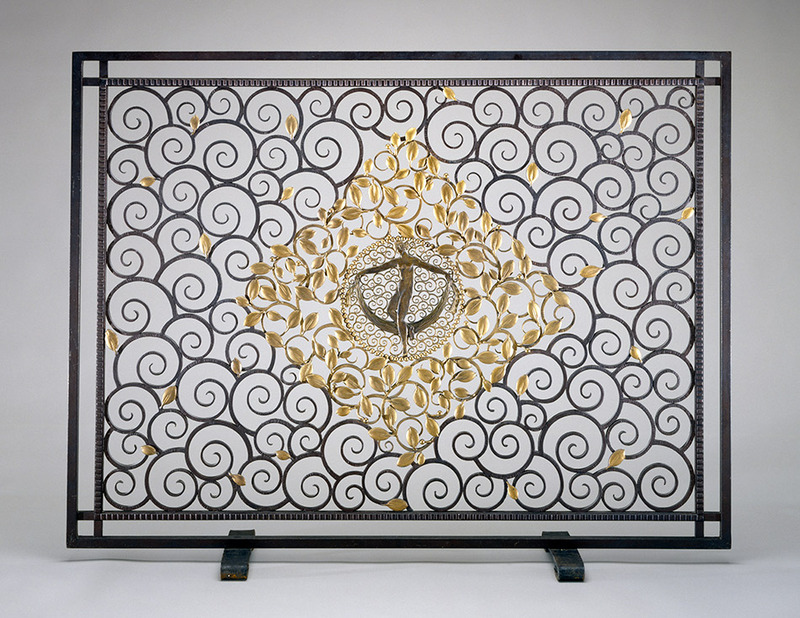 Carved, joined, and lacquered wood, eggshell, mother-ofpearl, gold leaf, cast bronze, 271.2 x 65.9 x 7.6 cm. Cooper Hewitt, Smithsonian Design Museum, Gift of Mrs. Solomon R. Guggenheim, 1950-104-1/4. 2. Marcel Coard (French, 1889–1975) Canapé Gondole, c. 1925. 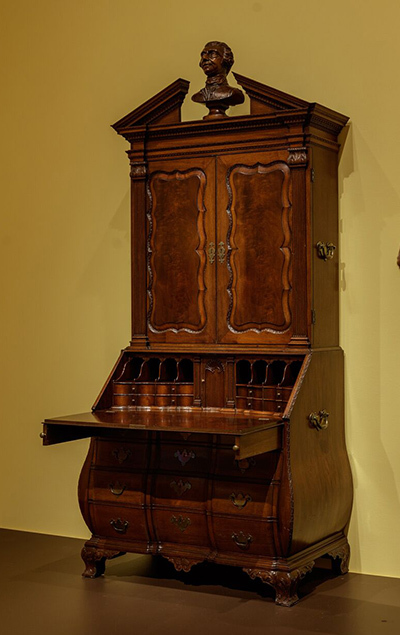 Carved Indian rosewood, Indian rosewood-veneered wood, brass, linen velvet, 92.3 x 247.5 x 87 cm Private Midwest collection. 3. Baccarat (French, Baccarat, est. 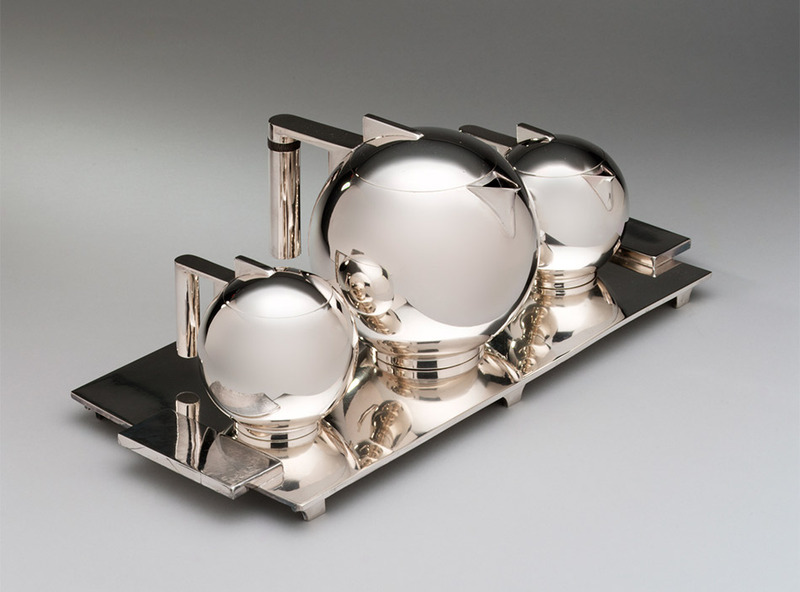 1764) Georges Chevalier (French, 1894–1987), designer Christofle (French, Paris, est. 1830), frame. Chandelier, 1925. Glass, metal h. 274 cm, diam. 167 cm Private collection. 2. Claggett Wilson (American, 1887–1952) Dining Chair, Dining Room of Adolph Lewisohn, New York, 1925. Bird’s-eye maple, black fabric 99 x 49.2 x 55.9 cm. Collection of John C. Waddell. 3. Dressing Table and Bench, c. 1929. After Léon Jallot (French, 1874–1967). Lord & Taylor (American, New York, est. 1826), retailer. Lacquered joined wood, mirror glass, metal; table: 79.3 x 105.4 x 60.3 cm; bench: 49.5 x 54.8 x 31.5 cm. Cooper Hewitt, Smithsonian Design Museum, Gift of James M. Osborn, 1969-97-7a/i. 1. Edward McKnight Kauffer (American, 1890–1954) Wilton Royal Carpet Factory Ltd. (British, Wilton, est. 1740), manufacture. Carpet, 1929. Hemp and wool: plain weave with supplementary wrapping wefts forming cut solid pile through a technique known as “Ghiordes knots” , 213.3 x 119.8 cm. The Art Institute of Chicago, Royalties from the Warner Fund, 1987.21. 1. 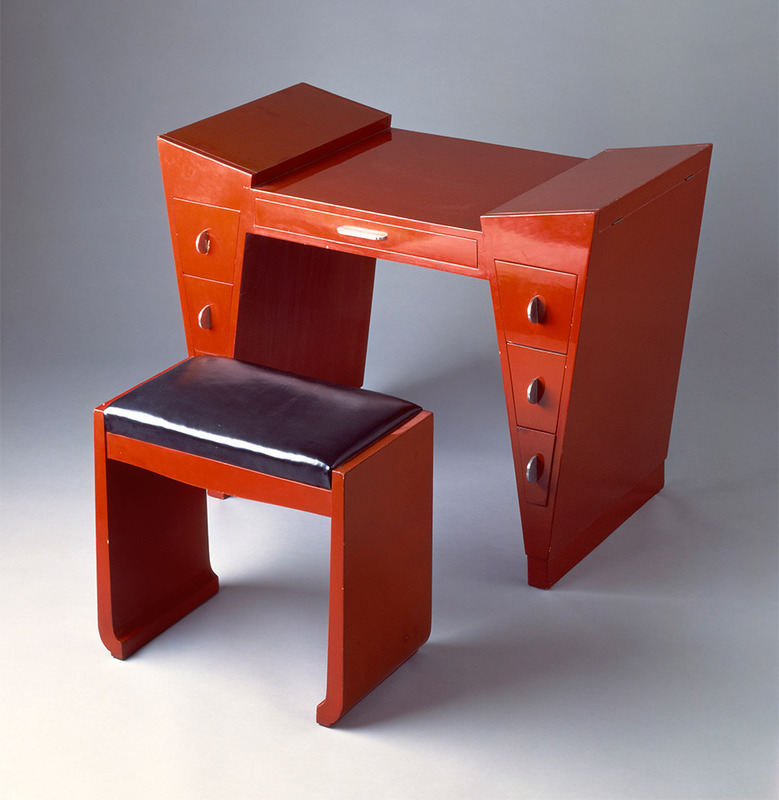 Émile-Jacques Ruhlmann (French, 1879–1933) Tibattant Desk, c. 1923. Macassar ebony, ivory, leather, aluminum leaf, silver, silk, oak, lumber-core plywood, poplar, mahogany, 112.4 x 59.1 x 39.4 cm. The Metropolitan Museum of Art, Purchase, Edward C. Moore Jr. Gift, 1923, 23.174. Image: © The Metropolitan Museum of Art. Image source: Art Resource, NY. 2. 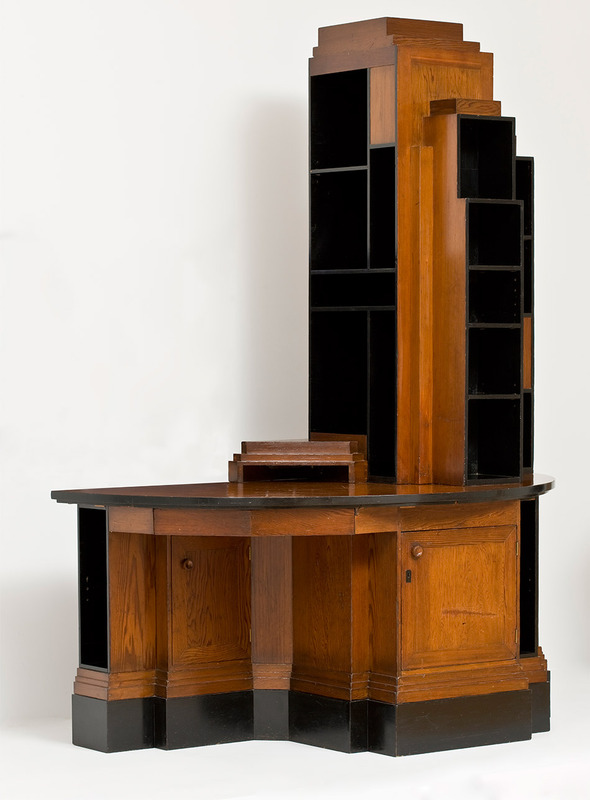 Corner Cabinet, c. 1923. Émile-Jacques Ruhlmann (French, 1879–1933). Kingwood (amaranth) veneer on mahogany, ivory inlay; 126.7 x 80.6 x 59.7 cm. Brooklyn Museum, Purchased with funds given by Joseph F. McCrindle, Mrs. Richard M. Palmer, Charles C. Paterson, Raymond Worgelt, and an anonymous donor, 71.150.1. Photo: Brooklyn Museum. ARMCHAIR: Kem (Karl Emanuel Martin) Weber (American, b. Germany, 1889–1963) Grand Rapids Chair Company (American, Grand Rapids, MI, 1872–1973), manufacturer. Armchair from the Kem Weber Group, designed 1928–29. Painted wood, synthetic leather, 105.4 x 53.4 x 50.8 cm. The Cleveland Museum of Art, The Mary Spedding Milliken Memorial Fund, 2003.4.1. SIDEBOARD: Kem (Karl Emanuel Martin) Weber (American, b. Germany, 1889–1963) Sideboard from the Kem Weber Group, 1928–29. Sage green painted wood 83.9 x 182.8 x 48.3 cm. The Cleveland Museum of Art, The Mary Spedding Milliken Memorial Fund, 2003.4.2. CANDLESTICKS: Hagenauer Werkstätte (Austrian, Vienna, 1898–1987) Kaktus Candlesticks, c. 1930. Nickel-plated brass h. 58.7–59.7 cm Private Midwest collection. Works that show how Americans equated “good taste” and social success with older European styles of design, a trend showcased through some of the finest colonial revival decorative arts produced in America.Antiquing became a national pastime and, along with the purchase of historic reproductions, formed the cornerstone of traditional American decor. 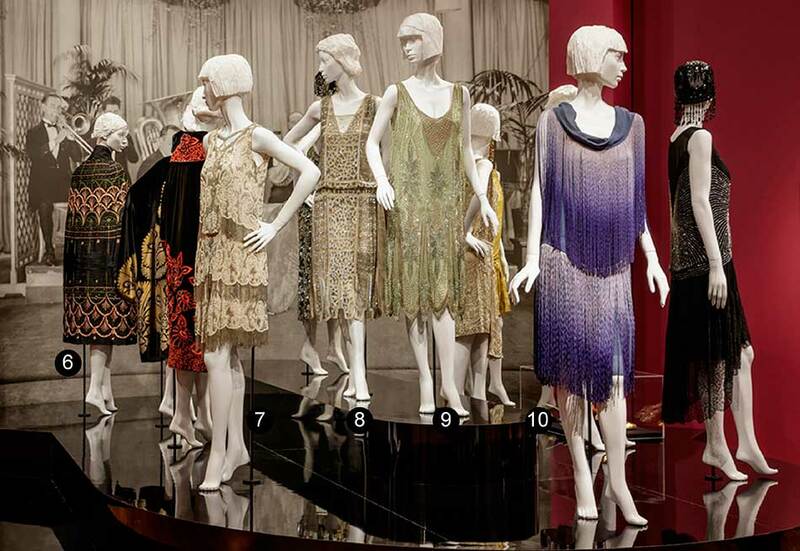 Highlights the technological and stylistic innovations of the 1920s that became widespread in America by the early 1930s. Modern design of pure form and minimal decoration fit the era’s innovations in new technology and industrial materials, such as tubular steel, rubber, plastics and chrome. 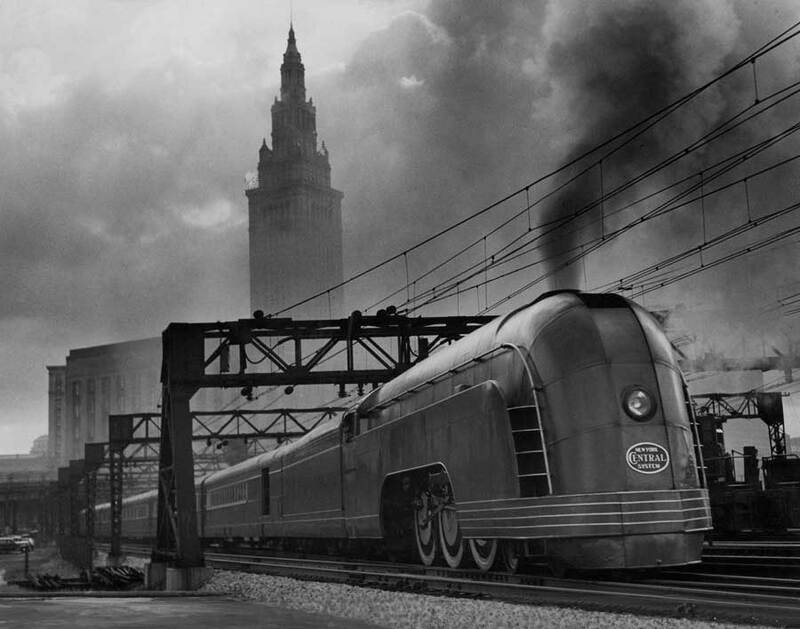 Revolutionary advancements in transportation were accompanied by new aerodynamic designs that emphasized speed. 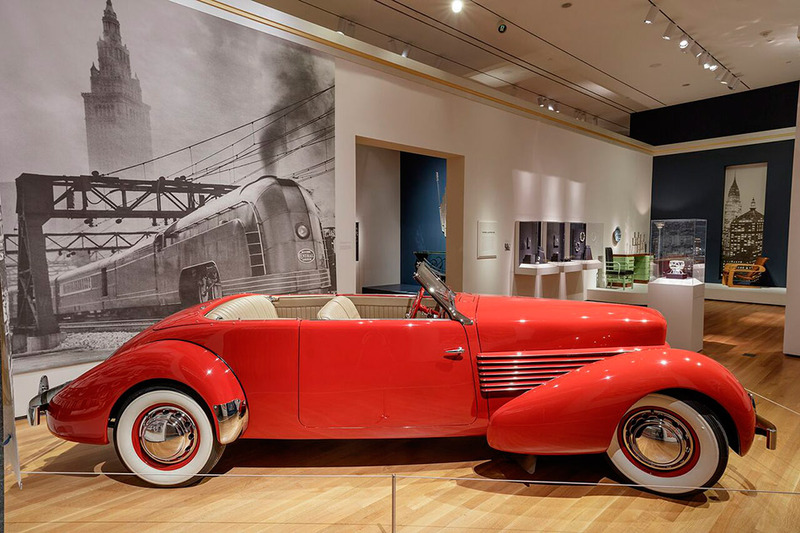 The popularity of this aesthetic informed the look of both luxury goods and everyday objects, heralding a new age of machines. 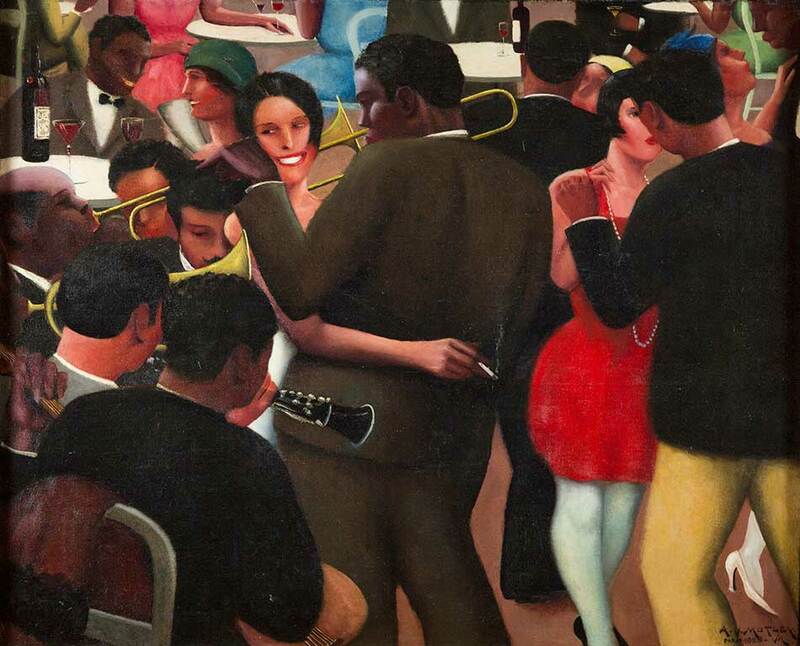 The decade known as the Jazz Age was a time of growth and fortune, oppression and revolution. Spurred by innovation and the audacity of youth, architects, artists, musicians, filmmakers, and designers alike created unprecedented responses to the demand for a new American lifestyle; some looked back for inspiration, and others marched forward with ideas for a fresh vocabulary to voice the optimism of the day. 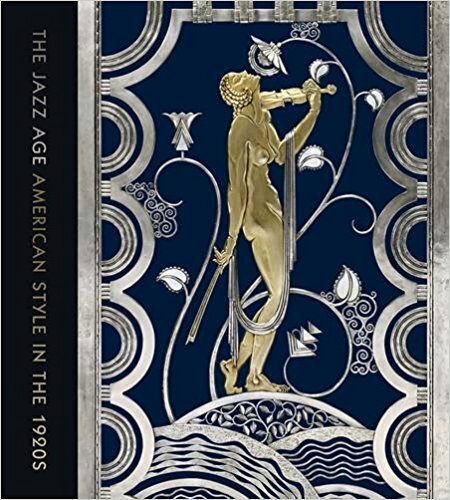 Lavishly illustrated with hundreds of full-color illustrations and featuring essays by two leading historians of decorative art and design, “The Jazz Age: American Style in the 1920s” reveals how designers established a new visual representation of modernity within the context of a changing world. 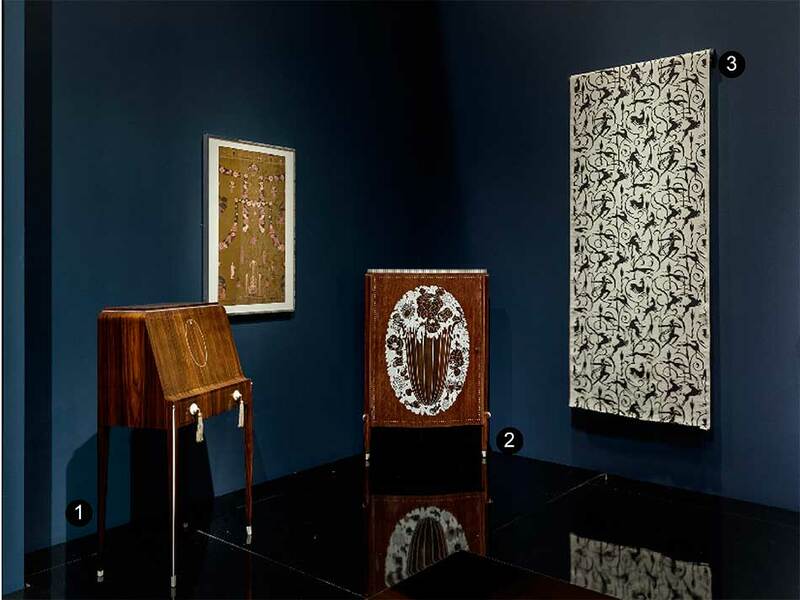 Co-organized by the Cleveland Museum of Art and the Cooper Hewitt, Smithsonian Design Museum, New York. The Cleveland Museum of Art is renowned for the quality and breadth of its collection, which includes almost 45,000 objects and spans 6,000 years of achievement in the arts. The museum is a significant international forum for exhibitions, scholarship, performing arts and art education and recently completed an ambitious, multi-phase renovation and expansion project across its campus. 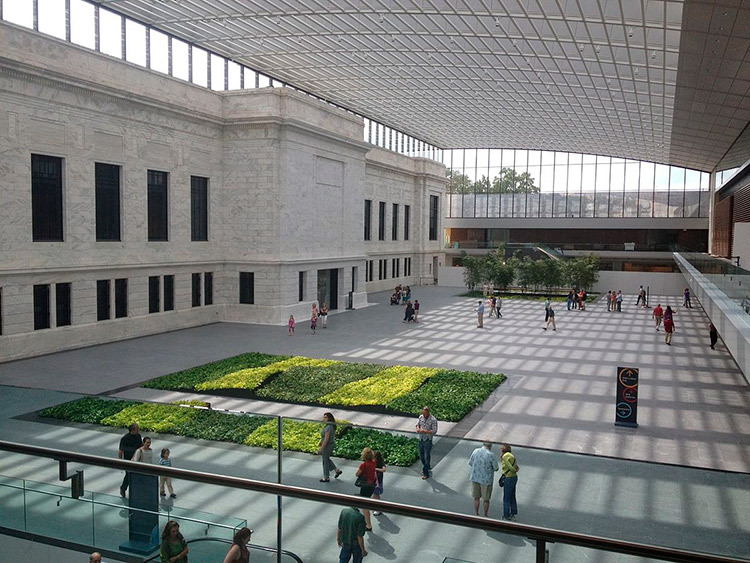 One of the top comprehensive art museums in the nation and free of charge to all, the Cleveland Museum of Art is located in the dynamic University Circle neighborhood.